This is a revised and enlarged version of the 1922 edition with the same title (Cf. 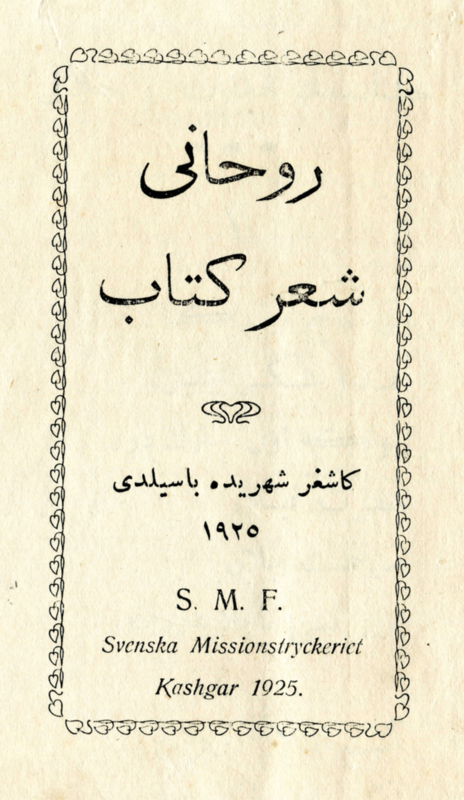 1922:3), containing 192 songs translated from Swedish into Eastern Turki by various authors, such as Raquette, Högberg, O. Andersson and so on, whose names appear under each song-title. The song-book was edited by Gustaf Raquette. The 1922 edition is a revised edition of the 1913 songbook (cf.1913:5) containing 53 songs. The original edition from 1913 has 62 pages and its enlarged edition has 80 pages. Pages 63-80 were printed in 1916 as an addition to the 1913 song-bok. In 1913:5, after page 80, a print from 1922 follows with 102 pages. This is most probably the print 1922:3 that has been merged together with 1913:5.